Cheerful elderly people walking outdoors. Couple of seniors having summer tourism. Summer leisure of retired people. Cute couple of seniors dancing outdoors. Beautiful elderly people near river, summer nature background. The best rest ever. Elderly couple kissing near water. Old man pointing with finger distance on summer nature background. Leisure of senior couple. Old couple with bubble blower. Slow motion senior people on summer nature background, woman blowing soap bubbles. Elderly people having fun together. Senior people dancing on nature background. Elderly couple performing beautiful dance at lake. How to spend time on a pension. 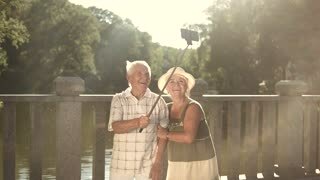 Senior couple enjoying nature near water. Elderly man and woman on summer nature background. Couple of pensioners having rest near river. Couple of cheerful seniors outdoors. Close up elderly man and woman blowing soap bubbles together on summer nature background, slow motion. Togetherness and family values. Elderly man and little girl outdoors. 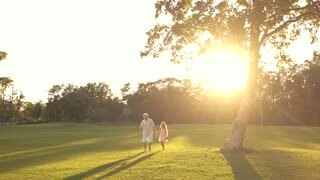 Grandfather holding hands with granddaughter and walking on summer nature background. Girl with grandpa in park. Happy childhood and carefree. Elderly couple dancing outdoors, sunny day. Amusing dance of senior people at lake. Retirement and summer rest. Senior couple sitting near water. Happy elderly man and woman with picnic basket near river. Old couple having rest on nature background.